To see this child voluntarily using breathing as a calming technique made my heart soar. I still can’t explain how he made the connection, but his use of breathing has caused it to be more widely used by myself and the other children. It is amazing to see the change that comes over the classroom when we engage in breathing together; everyone becomes calmer, more relaxed, and conversation takes a more engaging tone. Using breathing techniques to calm down and settle into an activity is a priceless stress-relieving tool, and I am glad that the children remind me of that every so often. Sometimes I look around at the people that I work with and I think, “I really am just a big kid.” I enjoy doing things with the kids. Experiencing life with them is eye-opening, because it causes me to slow down and really think about aspects of life that I probably take for granted. Have you ever seen a child when they are satisfying their curiosity? I have a boy in my class who is simply as “boy” as they come. He comes in the morning completely “on” and he wakes up from nap completely “on”. The other day I put together a fishing activity in which I put strings of yarn on magnetic wands and paper clips on paper fish. I gave the wands to the kids and they began to fish. But about fifteen minutes later, I looked at this child. He had developed a pulley by using the hand that was not pulling the string in place of the wheel that most pulleys are made of. I watched him pull the yarn back and forth through his finger. He was absolutely oblivious to the noise of the other children in the classroom, completely intent on the actions of his hands and the magnet. A little later he explored the effects of the magnet as a pendulum, but he did not stay with that exploration for very long. Little moments like this define the direction of my classroom. Sometimes I worry that someone will say that my classroom is out of control, simply because children tend to use objects in ways other than their intended purpose when their patience with the intended purpose has lapsed. It is in these moments that children’s true capabilities can be seen. As adults we are so intent on each tool we use or item we have having a specific purpose, with no room for exploration of other purposes. We are stuck on not breaking something or not messing anything up. I very easily could have told the boy that “we don’t use the magnet like that!” But I would have lost out on seeing his calm, deliberate actions as he explored his pulley, and he would have lost out on the experience of exploring the pulley for himself. It makes me wonder, how many moments do we miss out on as adults because we simply don’t slow down? How many ideas do we miss out on because we take so much of what we think we know for granted? Do we stop to entertain ideas – no matter how crazy they may seem? Or are we too busy trying to be “normal”? Perhaps we need to search for the child inside us – the one who is curious about everything because everything is new and different and exciting. Maybe we need to pause for a moment like the boy did and discover just how many things we can do with an object, or try to do something a new way, just to see what it is like. 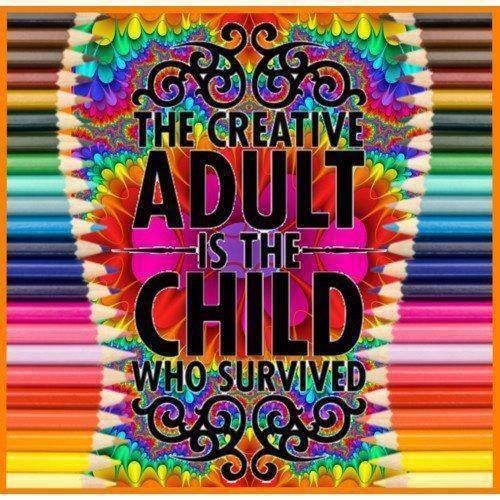 The point is, we need to rediscover that child within us. We need to remember what it feels like to be excited about the little things in life, and slow down enough to experience those little things. There is so much that we miss out on if we continue through life at breakneck speed. Several months ago, I posted about the Theory of Concentrated Attention. Today, I witnessed this wonder first-hand yet again. My 17 1/2 month old niece is a busy girl. She is constantly here and there, and never rests. Today I gave her two tools – a saucepan and a wooden spoon. Kiddo, my six year old, added a few more elements: two ping pong balls another saucepan, and a couple of bowls. With all of these tools, I witnessed my niece quietly and intently play for a solid 45 minutes before she began to lose interest in the activity. One note about the amazing nature of her play is her attachment to her grandmother. She adores grandma and becomes distraught whenever grandma leaves the room. While she was playing with the saucepans, spoons, balls, and bowls, grandma left the room several times and she didn’t even notice. She was so intent on her activity that I’m not even sure that she would have noticed if a train had come through the room. I was completely amazed by her activity and intentness, and it set me to thinking about my own classroom and the process by which I choose the toys that are made available to the children. I have always had a standard by which I have gauged the toys, but I have never really been able to articulate what that standard is. After thinking about it, I have figured it out. I only choose toys that the children have to act upon in order to achieve a desired end of their own making. Toys that have buttons and play music require the children to act upon them, but the end result is not the child’s desired end, but the toy manufacturer’s. I don’t have a single toy in my classroom that has any features like that. There were some in the room when I took the classroom, but I was very quick to pass them on to other classes. I work hard to provide a selection of toys that require active thought processes of children, as well as their physical and mental participation in achieving an end result. By selecting these kinds of toys and activities, I see the Theory of Concentrated Attention come to life several times a day, and each time I see it, it amazes me. I have many, many pictures of children in my classroom participating in engaging activities that they have chosen, some of which I hadn’t even dreamed of, but which their minds have conceived and in which they are actively using their imaginations to achieve a desired result of their own making. The process of learning is a wonderful thing. Since establishing a new classroom management system recently, I have become a lot more sensitive to how I treat the children in my care. In short, I try to treat them with as much respect as I can, realizing that they are people with feelings just like adults. It doesn’t take a lot to hurt or damage a child’s feelings, especially since they haven’t learned how to handle their feelings yet. That being said, I continuously witness people talking to and treating children with little or no respect, and the more I see it, the more it bothers me. The reason it bothers me so much is because I know that children who feel disrespected act out because they have learned no other way to handle what they are feeling at that time. I have seen massive, real changes in my classroom just in the last two months from implementing the simplest steps in how I interact with the kids in every situation, and it has made all the difference in the world as far as the behavior of the children in the class. Disrespect to a child can come in many forms and for many reasons, but it really shouldn’t happen at all. I look at the situations that I see around me where disrespect is involved, and I think, “Would I want to be treated like that?” The answer, of course, is no. One of the biggest areas where I see disrespect to children is in the area of punishment. I no longer use punishment in my classroom because I feel that it is the height of disrespect when it comes to children. I have also found that I don’t need to use punishment because I am constantly educating the children in my classroom in how to handle their emotions, how to treat the people around them, and how to treat all of the items in the classroom. I have found that when the children misuse something in the classroom, it is usually because I haven’t told them how it should be used. Either that, or the temptation to misuse a particular item is very strong. I mean, when you are on a diet, it is very hard to stay away from every slice of chocolate cake, right? Children have a natural tendency to use the items around them in accordance with their imagination, and anything can go. The job for the teacher or parent is to establish if what the child is doing is safe. If it is, let it happen! The child is probably enjoying using that item more for that purpose than any purpose that you could have come up with! But if the child is not being safe, it is time to step in and educate (not punish) the child on why their actions are not safe. If you punish the child instead of educating them, they have learned nothing from the experience and the unsafe behavior is actually more likely to happen again! Have you ever witnessed a situation where a child was disrespected? What do you think the child was thinking at the time? Feel free to share your thoughts in the comments section! I recently decided that I would plan to go back to school in the summer, a complete change from my earlier stance that I would not go back to school, period, no way, no how, end of discussion. I have been reflecting on my change of heart, trying to figure out what caused it. Well, there’s more to it than that; I know that an increase in knowledge is what caused the turn-around. I feel like I’m thinking about education in an entirely new light and I’m thinking about my job from an entirely different perspective. To be fair to my old perspective, I still do not believe that teachers are being taught how to teach effectively, and that they are still being taught the same old, tired theories that have gotten us here, but I have found a silver lining – the tides seem to be changing. One of my big problems with how teachers are taught to teach is the explanation of Pavlovian conditioning. Now, granted, I am not an expert in the field of behavioral psychology, but I believe very strongly that this sort of conditioning is very harmful to the human psyche. But it is being used every day in schools and pre-schools everywhere, and has been for years. The results have been disastrous. Children for years have been told what not to do. Punishments have been put into place to discourage those who don’t follow the rules. Bullying and fighting has increased and more and more students feel disconnected from their authority figures. The problem, it seems, is that our students are not being taught how to deal with people, and when they are taught, it is through the same conditioning methods used for everything else rather than through examples by teachers. No wonder – their teachers were raised on the same conditioning methods. Children aren’t learning about how to have healthy, mature relationships. Some may learn it at home, but most aren’t. And they aren’t learning it at school. Scores are going down as well. Is there a correlation? Is it the teacher’s job to teach about how to have healthy relationships? One of the definitions of education that I love is one by Leonard Peikoff from his “Philosophy of Education” lecture series. He states that the definition of education is “the systematic instruction of the young to develop in them the powers necessary for mature life.” I agree wholeheartedly with this definition and add that one of those powers is the power to effectively communicate and deal with people. It starts young – two, maybe three years old. A child takes a toy from another child because he wants to play with it. The other child cries. We soothe one child and give him his toy back, and then we reprimand the other child or put him in time-out. But what have we taught either child? We have taught one that when he cries or whines, he will get what he wants, courtesy of an adult. We have taught the other child that he gets attention from the teacher if he misbehaves. Positive or negative, it is still attention from the teacher in the mind of a child, and this kind of attention does not teach him the proper way to handle the situation – namely, asking the other child if they can share the toy or take turns, rather than taking the toy through the use of physical force. Likewise, the child that had the toy in the first place did not learn to use his own communication skills to tell the other child that he didn’t like their actions and to describe how he wanted to be treated in the future. From this age, communication problems explode into parents being unable to talk to their teenagers, spouses being unable to communicate problems effectively, and employers wishing that they had people working for them who could communicate to them, customers, or coworkers. The problem has reached the point that some college degrees require a course on interpersonal communications. Our job as teachers is not just about teaching children the three “R’s” but teaching them the skills they need to effectively navigate life, as well. This requires us to teach young children how to effectively deal with their emotions and to communicate their feelings to the necessary people effectively. It requires us to teach anger management skills to young children so that they will be able to handle life’s curveballs safely and calmly. But most of all, it requires us to make sure that our interactions with the children in our care involve the same types of respect, communication, and safety that we require the children to show to each other. One of the ways that this can be accomplished is to talk about your own feelings with the children. If they are not listening and you feel yourself becoming frustrated or angry, tell the children how you feel and invite them to join you in an appropriate anger management exercise, such as breathing. The best way to teach is through example, and when the children see you engaging in the same behavior that you are asking them to exhibit, the chances that they will exhibit that behavior are great. Teaching social skills to an entire classroom of children requires work, consistency, and patience, but the rewards are great. When you see children sharing and working together in a mature manner, and you know that it is because of all the work you have done, it is one of the greatest feelings in the world. Update: After some research, I have come to the conclusion that Pavlovian conditioning is not what I should have referred to. Pavlovian conditioning is a conditioning of the reflexes, which has nothing to do with the subject matter. The rest of my opinions in this post still stand. I’m sorry for any confusion that this may have caused, and I hope to clear up what kind of conditioning I am actually referring to in an upcoming blog post.